DIY - Mega Card fundraiser! with whom they will celebrate Christmas. Make the cards colorful and put the recipients’ name on each one so that it isn’t just a generic “dear friend” card. Make an announcement in the church bulletin so that everyone knows what the cards are for and how they work. Set the cards in the front of the church so that everyone can see them. 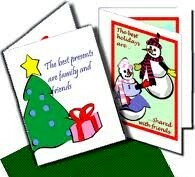 Deliver the cards a week before Christmas. Consider taking a few friends and singing Christmas carols. Be cheerful. Alternative: You could do the same with a get well card for a fellow student or teacher who is in the hospital or is out sick for an extended period. Set up a table in the cafeteria at lunch time and charge people to sign it. You could do the same for a teacher who is getting married, having a baby, etc. Use your imagination!